The new year holiday break was indeed refreshing, simply because I had missed “sleeping all day” and “working all night”. I always find my self working or studying better at night, provided I have the luxury of being able to sleep all day. While mom screamed and complained that I should cleanup my room at least once a year, I took the opportunity to continue sleeping fearless and shamelessly throughout the day and left the organizing work for the night. But instead of organizing my room, I opted for organizing my hard drive! The first thing that I did was to organize the tons of digital pictures I had lying around my hard drive. I had about three years of pictures taken at various events,vacation spots and just plain old home that was lying inside directories upon directories. So I installed one of the best opensource photo albums available, called gallery. Using gallery I was able to define albums and even sub nested albums to upload or move pictures. In the beginning it was tedious and time consuming since I was uploading the maximum limit of 10 pictures at a time while deciding on comments and captions for them. Later I discovered that zipping a whole directory of pictures and uploading the zip file was far more efficient. Unfortunately gallery didn't support tar.gz or tar.bz2 file formats that are resembled as “more FOSS”. Once I got bored uploading pictures after a couple of hours, I decided it was time to play with another tool I had installed some time back, called Tellico. 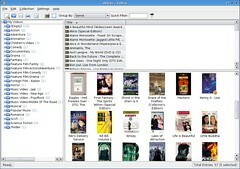 Tellico is a collection manager that can be used to manage collections and has off the shelf support for books, audio cd, DVD/Movies, stamps, wine etc. You can even define other collections through its extensible interface and best of all its Free & OpenSource software! I had a lot of DVDs lying around my table, so I first started to enter them in. The great thing about Tellico is its ability to search for a DVD title, actor or keyword on the Internet through portals such as Amazon or IMDB and display results. Once found a match you can have Tellico add that as a new record, thus saving valuable time that would otherwise be spent to enter a lot of meta details. Over a very short period and using a slow dialup, I was able to enter my 50 or so collection of DVDs. What actually took some what a longer time (which I hope is a feature that will be available in a future version), is to manually search for pictures of the DVD covers on amazon. One note of caution is that Tellico stores the complete collection in a single flat file that can result in the file becoming slow as the file grew. Therefore it is recommended that large pictures not be included and if possible to not include pictures at all and instead use a URL that points to the picture on the hard drive. Since my DVD collection is considerably smaller (compared to a video store), I nevertheless stored the images internally but only after properly resizing them. I used the following shell script to resize the amazon pictures to a more reasonable thumbnail size. Tellico provides several export options such as html or xml to publish your collection. I tried the html export of the my DVD collection and it generated a page containing a list of title that was hyper linked to a separate html page that had a picture of the DVD cover and details, similar to the main interface. Another useful feature includes the ability make note that the item is on load and who has borrowed it (by means of a comment). Once that was done, I went ahead and managed to enter a few books that were also lying on my table and some off the book shelf. By then I was too lazy to go look for pictures of the books so went to sleep at 4 AM in the morning, while my table and room continued to be in a state of disarray.